In a new and much-needed campaign, city authorities in Rome teamed up with volunteers to clean off sticky chewing gum from its priceless archaeological sites and cobblestone streets. The clean-up started off in Largo Argentina -- a historic square with the ruins of four Roman temples in the middle -- with volunteers and clean-up crews scraping off hundreds of chewing gums from walls, pavements and roads. "Every day, 15,000 sticks of chewed-up gum are discarded in the street, even in the archaeological sites," said Piergiorgio Benvenuti, head of Rome's garbage collection agency Ama, who came to oversee the start of the operation. "Each gum removal costs the city one euro," he said. The volunteers came from the organisation "Noi Per Roma" ("Us For Rome") headed up by Rome Mayor Gianni Alemanno's wife, Isabella Rauti. "Chewing-gum takes so long to disintegrate, people should think twice before leaving it on some marble or throwing it on the ground," she said. 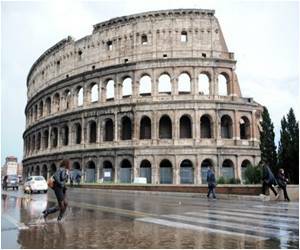 Visitors to Rome often complain about the Eternal City's level of cleanliness, although local authorities have made major efforts in recent years to improve garbage collection in the tourist-heavy historic centre. The busload of Swedes sweep onto the 326-year-old South African wine farm for a wine tasting visit that marries vineyard tourism with bottom-line marketing.